Lisa Scottoline and Francesca Serritella are back with another collection of warm and witty stories that will strike a chord with every woman, I'VE GOT SAND IN ALL THE WRONG PLACES! 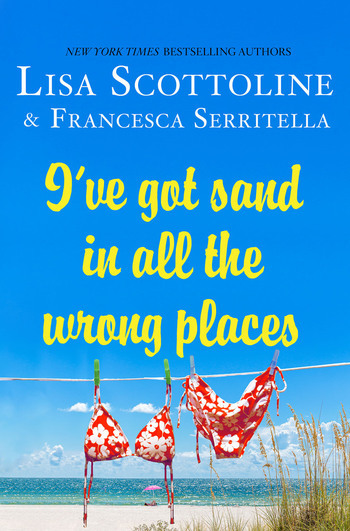 LISA SCOTTOLINE is the New York Times bestselling author of more than thirty novels, including the Rosato & DiNunzio legal thrillers (beginning with Accused). Her standalone novels include Save Me, Don’t Go, and Dirty Blonde. Scottoline has won an Edgar Award and Cosmopolitan magazine’s “Fun Fearless Fiction” Award; multiple Earphones Awards for her nonfiction book recordings; and a “Paving the Way” Award from the University of Pennsylvania. She has served as the president of Mystery Writers of America and teaches a course on justice and fiction at the University of Pennsylvania Law School, her alma mater. She lives in the Philadelphia area. Scottoline and Serritella write a weekly column, “Chick Wit”, for The Philadelphia Inquirer. The columns have been collected in Why My Third Husband Will Be a Dog; My Nest Isn't Empty, It Just Has More Closet Space; and Best Friends, Occasional Enemies, among others.